Made with LUMINOUS and light silver plated and elegant bronze chains, this curtain tieback is a chic idea for tying curtains in a very easy way. It has been enriched with very luminous silver glass pendants so that it’s not only a decoration for your curtains but also for your wall. It has a big silver hoops to be hung at your wall hooks. 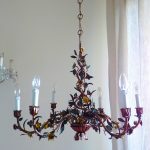 The listing is for 1 decorative tieback, please select more pieces for multiple orders or contact me.